Scribble down a PC wishlist and Intel's Core i7 990X is the bee's knees. Saliently putting the £770 asking price aside for a moment, the 3.46GHz chip is the fastest consumer CPU available - no ifs, buts or maybes, and Intel can readily release a '995X' that's nothing more than a minor clock bump - the architecture still has frequency legs to spare. The Core i7 3960X matches the Core i7 990X's speed when five or six cores are used and beats it if fewer cores are active. 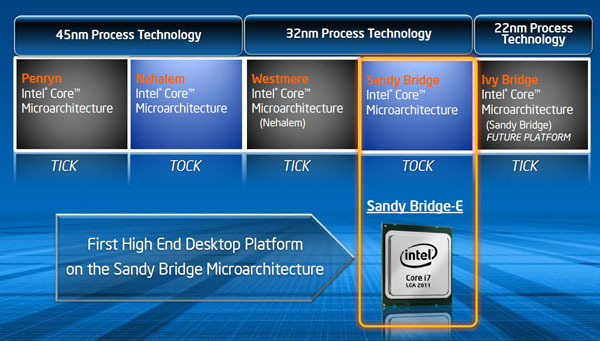 Not escaping the eye of the eagled-eyed reader, Core i7 3960X continues with Sandy Bridge's 100MHz base clock, meaning multiplier jumps are 100MHz, not 133MHz, per the older Core i7 990X. The takeaway here is that Intel is making better use of the chip's TDP, maximising performance through a more-granular Turbo Boost implementation.